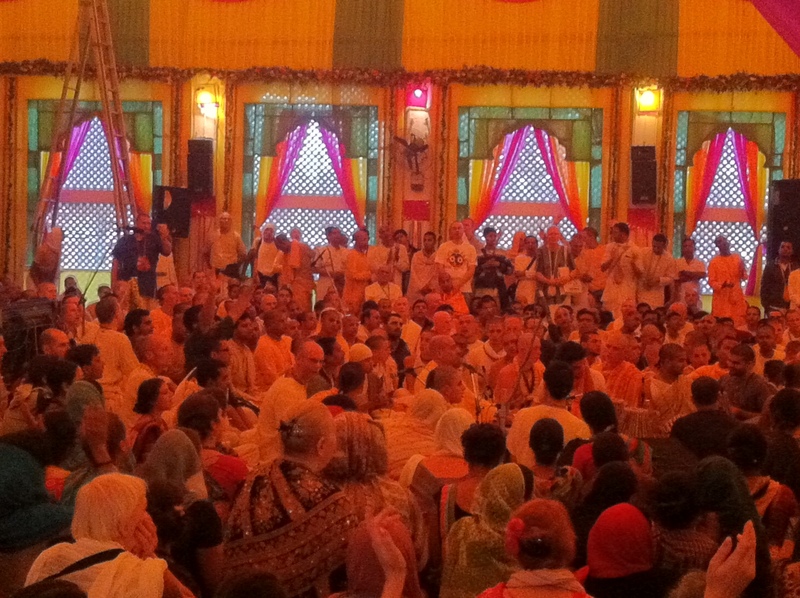 By the mercy of Sri Guru and Gauranga I was able to visit Sri Mayapur Dhama and then to Jagannath Puri this week. I can write pages and pages about my experience there and am sure the same will be the case with most of us who travel to Dhama and come back with varied realisations and observations. I will try to summarise my experience in brief at both the Dhams in short. 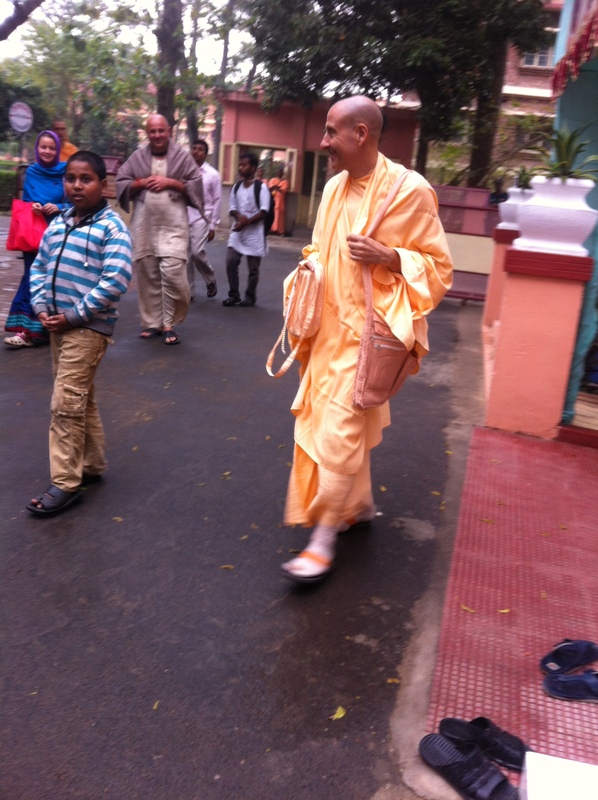 I had gone, for the first time, to Mayapur, almost the same time last year with Shyam Sundar Prabhu. We had planned to go again together and I was looking forward to it. Few weeks before the trip Prabhuji told me that he may not be able to go as he may not get leave from the office. My first internal reaction was to drop the trip and go with him only whenever he could make it. Prabhuji pushed me to go alone or find some devotee but I dragged my feet. He, then, suggested that why don’t I take my family, I wasn’t sure whether they would be willing to come or not. Prabhuji pushed me. 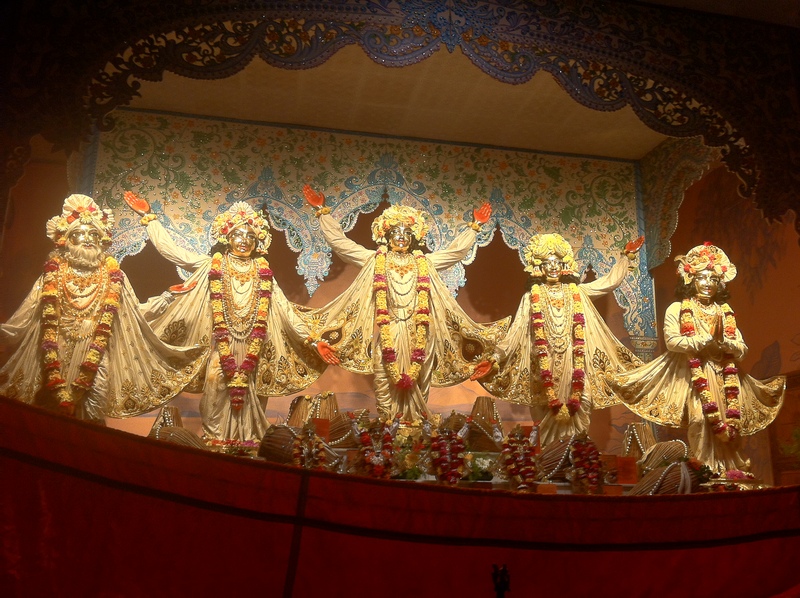 I prayed to Srila Prabhupada and asked my wife if we can all go to Mayapur and as a carrot I suggested that from there we can all go to Jagannath Puri and we can all stay in their favorite resort there, Coco palms. She agreed at one go, making my heart leap in the air, it was nothing short of a miracle for me. Later, she also suggested to bring her sister along with us, who too joined us. a. Trust advise from devotees who are close to me, have faith in them and then use my own intelligence to walk that path. b. Praying to Srila Prabhupada, even for selfish devotional reason, always helps. All I need is to have faith in him. For a change we went by an overnight train to Kolkata from Delhi. One reason was of course budget as the ticket prices went too high for my budget and secondly I was advised by Guru Maharaj to travel by train more often. The 2 Tier Rajdhani was comfortable and we reached Kolkata on the dot and there was a cab waiting for us from Mayapur, which I booked via internet the same morning from temple. We took the longer route via Kalna and it took us almost 5 hours. As we came nearer to Dhama the air changed and suddenly everything looked and felt pure, the air, the scenery, it was so refreshing just to be here. 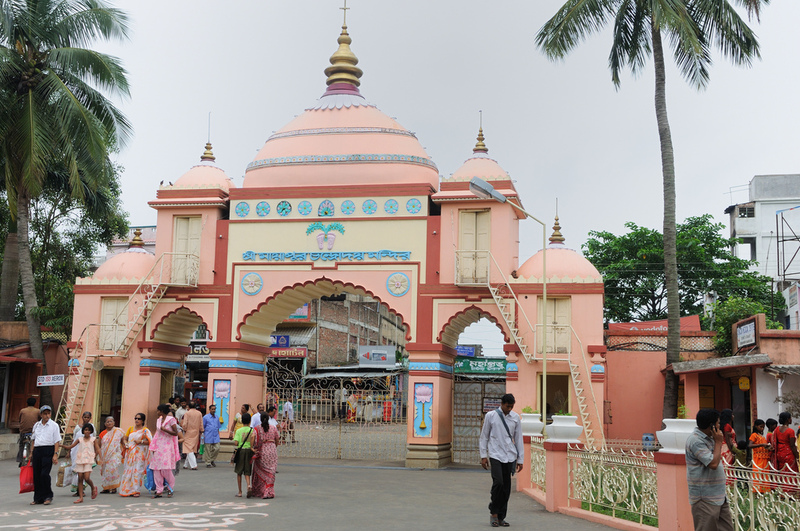 As we took the final sharp left/ U turn from the railway tracks towards ISKCON my heart beat went faster and with great anticipation I crossed many of our previous Acharya’s home, Yoga Pith and finally under the shelter of Srila Prabhupada at ISKCON gates. All glories to Sri Mayapur Dhama. There was an initial confusion about the availability of room and I was even getting mentally ready to stay outside the Ashram but then so many devotees came to help and within 20 minutes instead of no room I had choice of rooms in different buildings ! a. This lessons holds me good whenever I visit any Dhama. I try to remain in complete surrender to the Dhama, atleast as far as my boarding and lodging goes :). I know Dhama doesn’t need a shudra like me still I have complete faith in my heart that with a mood of surrender mercy flows, howsoever long may be my list of disqualification. b. I must learn to go out of my way to help any devotees and never to be indifferent to the smallest of the requests I receive. It was simply transcendental to take the darshan of Pancha Tattavas & Sri Radha Madhav and then sit down and hear HH Radhanath Maharaj doing Kitan, pure bliss. It was tough for me to leave the temple and look after the needs of my family but I did that nevertheless. 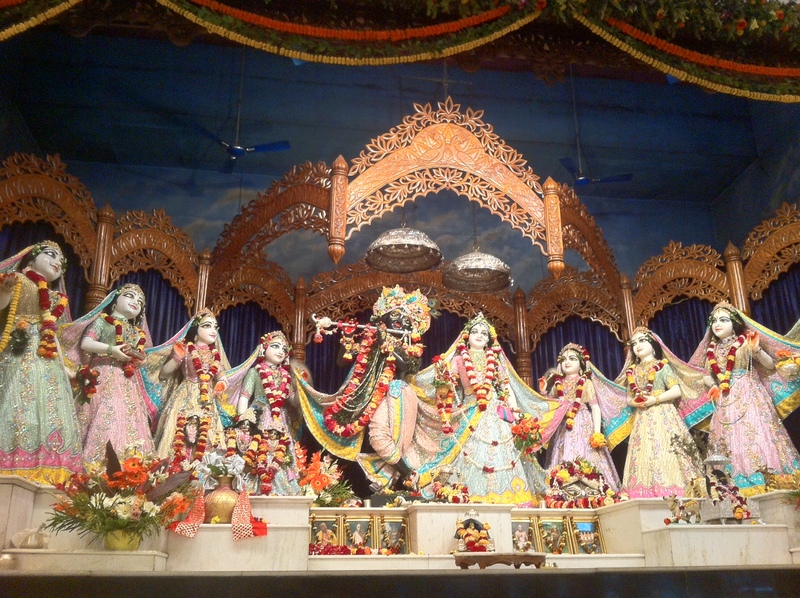 ISKCON Mayapur wore all the looks of a festive atmosphere, getting ready for a transcendental climax. It was a bumper harvest for me as far as seeing so many Sanyasis at a single place and also getting association of senior devotees from Delhi who are usually very busy. I could meet HG Amogh Lila prabhu. I shared with him how I have recently been diagnosed with a serious disease, by one of the most experienced Sanyasi `doctor’, in which my heart is becoming harder and I am running after only `Jnana’. Prabhuji prescribed some `medicine’ to get a cure from this dreaded disease, the crux of which was that I must serve out of my comfort zone. Prabhuji said all my devotional activities are centered around my own comfort zone and I must take some activity which make me uncomfortable or is not to my taste ! And then cheering me and bringing me instantly out of my sulky mood he declared that this disease, of having a hard heart and only running after knowledge, and so many other disqualifications are indeed my qualification to get mercy of Gaur Nitai. In seconds Prabhuji snapped me out of my depressive mood which I was having ever since I was diagnosed with this particular disease. He also instructed me on many practical aspects of my spiritual and material life. All glories to HG Amogh Lila Prabhu. 3. Serve the local centre more. 4. Donate more. 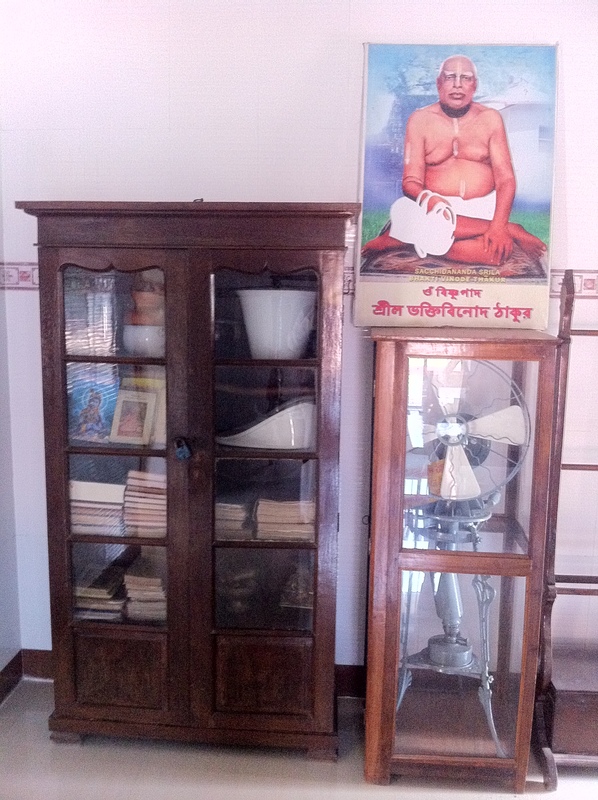 Prabhuji said that I have to ensure that in some way my body, mind and words are being used in the service of the Lord. He also added that the `moha’ of money is more difficult to give up and that I should work on it. 5. 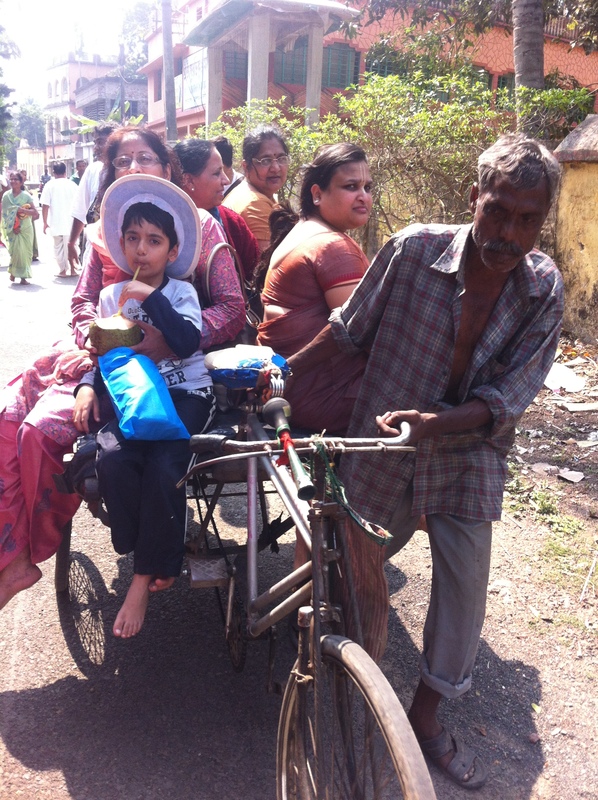 Spend more time with family members, take guidance from mature Grahstha devotees to ensure a proper balance. By the causeless mercy of Lord I got association of so many devotees. I met Karuna Prabhu and Nityananda Ashray Prabhu and Bimlaprasad Prabhuji from Punjabi Bagh temple, they were all there with a large no. 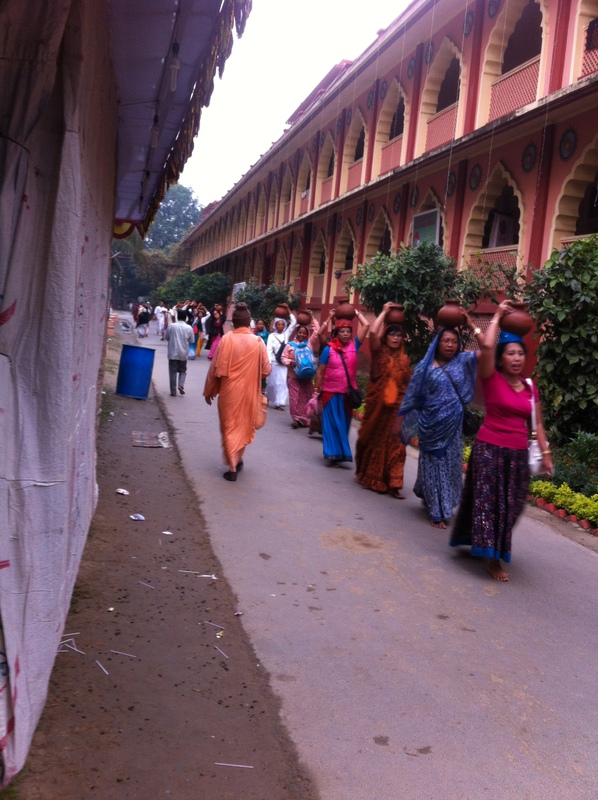 of new congregational devotees. They took pity on me and took me and my family along with them for next two days on various trips around the Dhama. The lecture Rukmini Prabhuji gave at the Rajapura temple was so very grounded and yet profound in its basic understanding of offering Bhoga to deities. a. I must open my heart to my shiksha gurus and admit, without any shame, my shortcomings. I have seen Shyam Sundar Prabhuji practicing it and it took some courage for a weak person like me to start practicing it. b. I must constantly endeavour to improve `internally’, just improving the externally won’t help me much. c. I should remember to beat my mind three times a day with a broom because it convinces me every time that I am doing fine as a devotee and do not need any help from devotees. And then as a bonus I had a great time at whatever Kirtans I could attend, eyes of HH Radhanath Maharaj fell on me purifying me instantly, HH Gopal Krishna Goswami Maharaj met for a brief 30 seconds purifying me further, and finally I could take darshan of Guru Maharaj (more of that I would write separately). 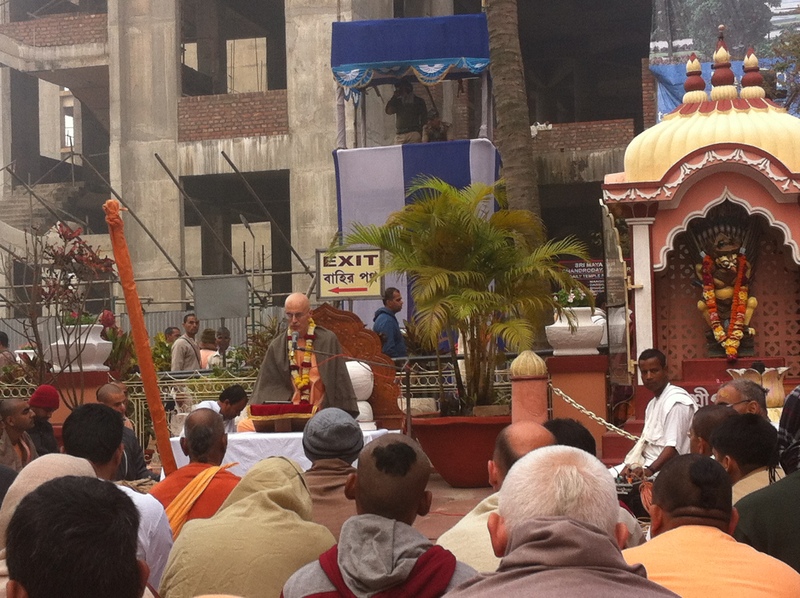 Each Mangal Arti and Kirtan was special and so was the special maha Abhishek of Pancha Tattavas on 3rd March. 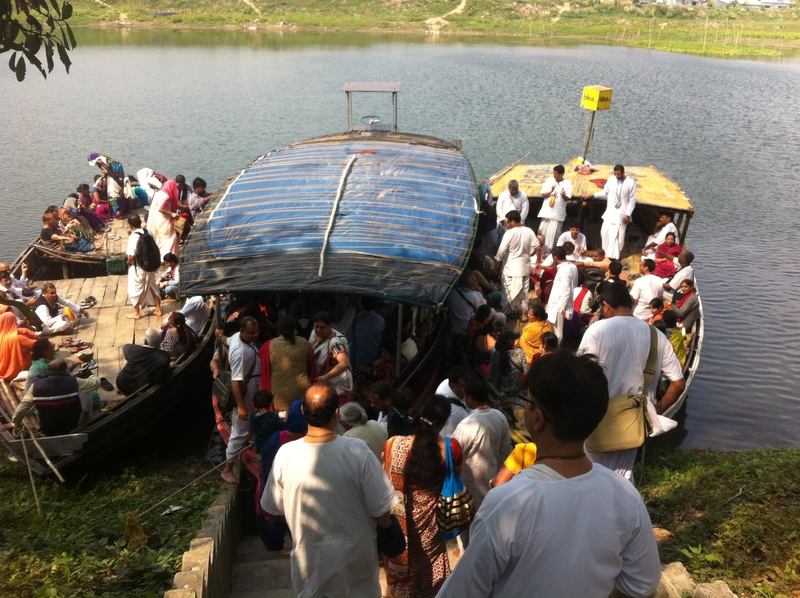 Hundreds of devotees rubbed and collected chandan and also brought Ganga Jal for the Maha Abhishek. 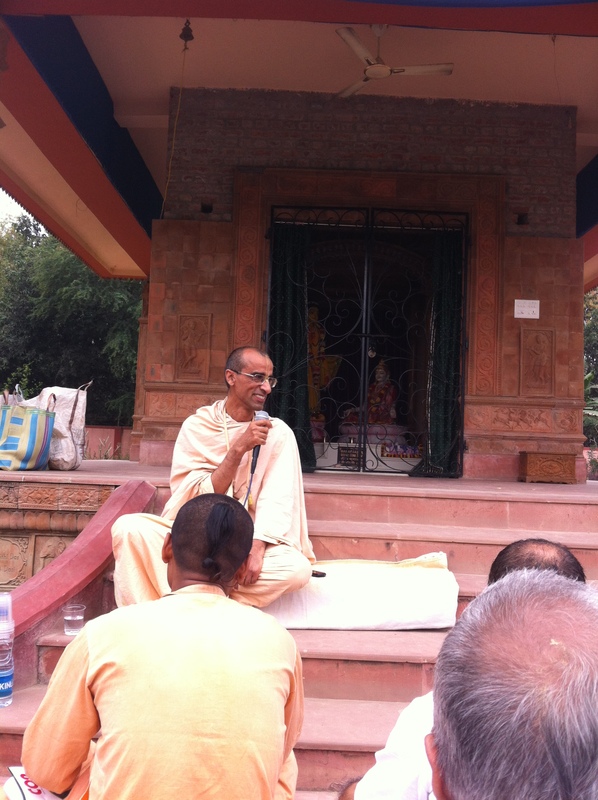 On the last day we heard a wonderful SB class by HG Dravida Prabhu. Prabhuji gave us a gem of a verse to meditate upon while praying to Lord. Here it goes. Shyam Sundar Prabhu, Murari Prabhu and myself have taken timeshare accommodation in an upcoming building in the complex for 60 days in an year. 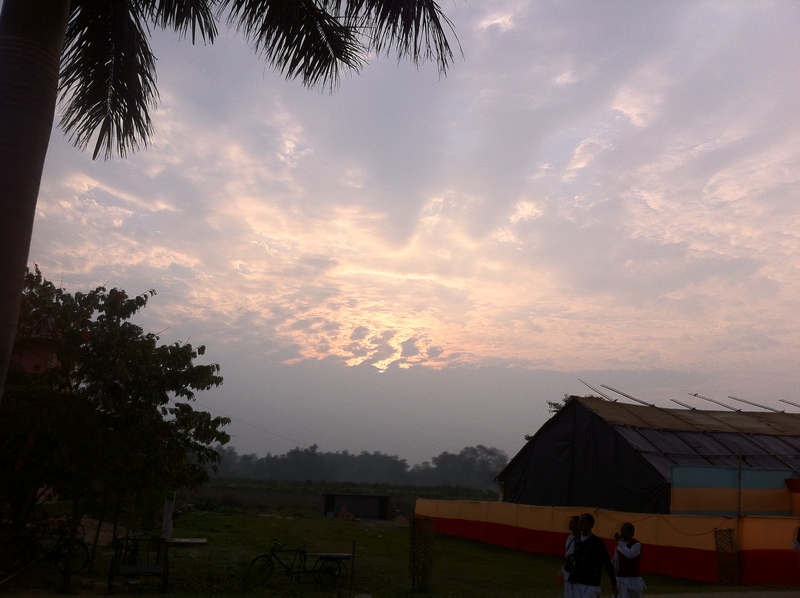 Initially I was wondering that apart from these 4-5 days in March when would I ever go to Mayapur. But on this trip I felt that even all the 60 days could be less as my attachment for MahaPrabhu and Sri Mayapur Dhama grows exponentially. This entry was posted in ISKCON, My realisations, My spiritual Journey and tagged Amogh Lila Prabhu, Gopal Krishna Goswami Maharaj, HG Dravida Prabhu, HH Radhanath Maharaj, improve internally, MahaPrabhu, Mayapur Dhama, Panch Tattavas, Radha Madhava, Rukmini Krishna Prabhu, Surrender to Dhama. Bookmark the permalink. ← What is love of Godhead ?